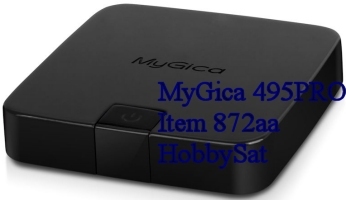 Ne vous trompez pas sur la taille réduite de l'ATV 495PRO, avec de sérieuses mises à niveau de notre Mini-boîtier Android, MyGica a réussi à atteindre l'étape supérieure de l'excellence. Un regard vers l'intérieur du boîtier révèle des composants haut de gamme qui doublent le nombre visible de trames en 4K, les avancées les plus récentes en technologie WiFi ac, un décodage matériel en 10-bits, et bien plus. No se deje engañar por el tamaño diminuto del ATV-495PRO. Con mejoras en serio en nuestra pequeña caja Android, MyGica triunfa en lograr el siguiente nivel de excelencia. Una mirada por dentro revela los componentes de primera clase que duplican el número de cuadros 4k por segundo que pueden verse, los últimos avances en tecnología WiFi, la decodificación por hardware de 10 bits y más. The box features the advanced Quad Core processor running on Android 5.1 operating system, supporting Google Chrome browser, wire and wireless networking access, USB external hard disk, and single hand keyboard, mouse as well as normal remote control. Kodi, formally known as XBMC, is a media player platform that allows users to play and view most videos, music, such as podcasts from the Internet, home network and all common digital media files from local and network storage media. 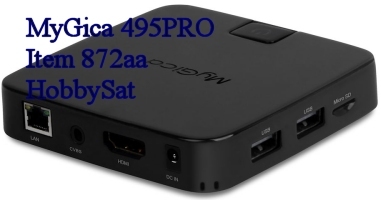 The ATV 495Pro comes pre-installed customized and optimized with Kodi, with hardware decoding up to 4K2K Ultra HD support. 3x Faster Wi-Fi speed than Wireless-N Wi-Fi. 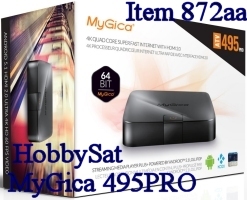 Wi-Fi 150% wider/Ultra-wide coverage for large homes and multi-floor locations via MyGica ATV 495 Pro. H.265/HEVC is a successor to H.264/AVC. Compared to H.264, H.265 data compression ratio is double at the same level of video quality. It can alternatively be used to provide substantially improved video quality at the same bit rate. 10bit colour decoding, supports maximum 1.7 billion colour depth, 60 times more than normal 8bit colour decoding. Gives you more natural, more real picture colour. 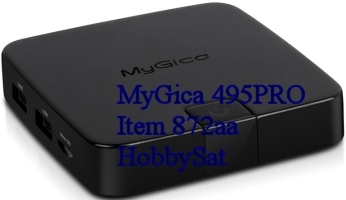 MyGica Andoid TV Platforms/Solutions benefit from MyGica's worldwide secure online update service, to always provide the latest, safest and greatest Firmware and Applications that are available. WiFi: 802.11ac 5.0 GHz Dual Band/802.11b/g/n 2.4 GHz.